Kuntillet`Ajrud, Sinai Caravansarai, ca. first half of 8th centry BCE. 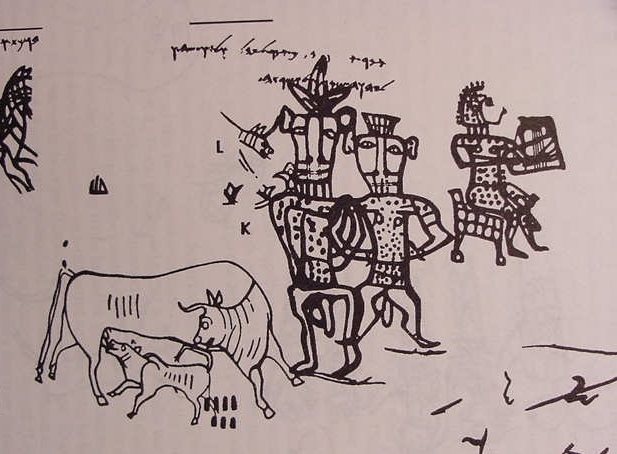 Drawing of Yahweh of Samaria and his Asherah on a pottery shard (Pithos A). Inscription in Hebrew reads "Thus says...Say to Yehalle[lel], Yo`asa and...I bless you (herewith- or: have blessed you) to/before Yahweh of Samaria and his asherah." 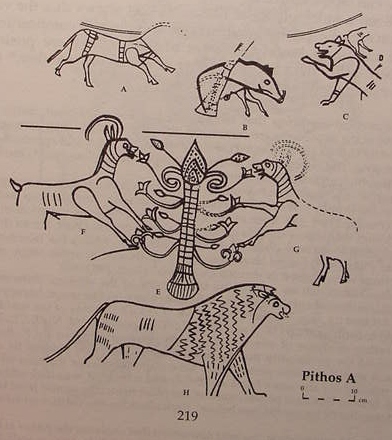 Note the portion of bridled horse to the left of the figures (pp.225-6, "Baal, El, Yahweh, and 'His Asherah'," Othmar Keel and Christoph Uehlinger. Gods, Goddesses, and Images of God in Ancient Israel. Minneapolis. Fortress Press. 1998. ISBN 0-8006-2789-X ). I further understand that Yahweh is being portrayed on the Ajrud potsherd as a Bull-calf, his consort, Asherah,being a hornless Heifer, rather like Baal-Hadad's ability to assume the form of a bull to impregnate his lover, Anat, who takes on the form of a Heifer, conceives, and gives birth to a bull-calf.